Our sponsored 48 hour marathon live broadcast, in aid of Children In Need, began at midday on Friday 17th November 2000 and finished at midday on Sunday 19th. 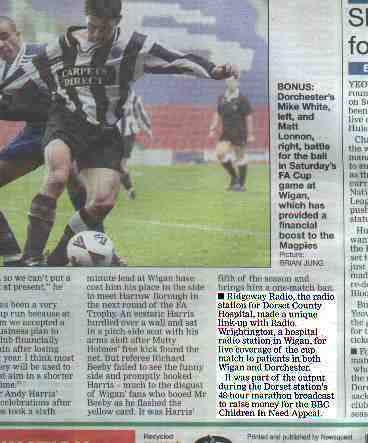 The broadcast included a live link up with Radio Wrightington, the hospital radio station for the Wigan area, for their commentary on Dorchester Town’s FA Cup tie with Wigan, the hosts winning 3-1. Our coverage resulted in the two press items below. We are very grateful to Radio Wrightington for all their help. Also, during the final leg of our broadcast on the Sunday morning, we briefly linked live to BBC Radio Solent. The picture on left is from the sports page of the Dorset Echo 21st November 2000.